Founder & CEO of business process outsourcing and sales optimization firm specializing in: cloud based document management outsourcing, managed print and content services and sales and marketing optimization. Clients included Blackstone, Cisco and the Outsourcing Institute among others. Developed and introduced Sagamore MCS™, a cloud-based managed content services product for the Small- to Medium-sized business market. Constructed a new sales process that incorporated a new go to market strategy that best utilized the client's sales assets in the field. Created an ideal client profile and target market that dramatically improved client acquisition by over 67% in the first year. Negotiated a worldwide MPS implementation that saved a client 25% annually over current costs. Develop customized sales training curriculum that enabled client's newly on-boarded sales directors to ramp up productivity faster. Implemented CRM and built discipline around sales pipeline reporting that drove accountability and transparency. Designed compensation plans that link rewards to client's financial results. Rebuilt client's entire marketing organization— new website, integrated marketing and lead generation and new corporate branding. Global Sales and Marketing Global sales and marketing leader for the $1 billion management services and BPO division of Pitney Bowes. Accountable for revenue and EBIT growth as well as client retention. Strategically transformed organization from a geographic model to a vertical market model. Rolled out a new sales go to market coverage model that stressed vertical market expertise with horizontal product platform specialization. Vertical markets include finance, insurance, public sector, technology. Horizontal products would include mail services, document services, records and information management and customer communications. Redesigned integrated marketing campaigns utilizing enhanced database which drove lead generation up 39% in first year. Redesigned the professional services practice, integrating solutions with vendor partners and bringing profitability to the group for the first time in years. New go to market results: Improved new business contracted revenue by 68% YOY in the first two quarters of 2010. Gross margin in the same period increased 23% and client retention improved 63%. Refined sales process to stress higher business process transactions. Average transaction size has increased 21% YOY. Vice President of National Accounts Senior executive for this $10 billion company with full P&L management of $250 million and EBIT of $18 million for its work apparel and uniform services division. Oversaw National Accounts program, with the challenge of revitalizing revenues and profits after years of decline. Led organization to achieve substantial profits and revenue growth year over year. Member of prestigious Executive Leadership Council comprising the top 250 executives in the company. Developed sales strategies targeting large national accounts such as McDonald's, DHL, YUM Brands, PepsiCo, ExxonMobil and USAir. Substantially grew new client accounts with $14 million of new annualized revenues in 2008 when prior new client averages were $1-$2 million per year by aggressively targeting competitive accounts. Reengineered internal business process that allowed sales organization to focus more on value-added selling and less upon internal operational functions. Increased overall national account margins by over 300 basis points year over year by focusing on formerly neglected profit components such as addition of profitable items, deletion of unprofitable programs, cost savings through better sourcing and manufacturing and dramatically reducing overhead expense. Progressively promoted within this $1 billion leading supplier of office imaging equipment and support services in the United States, beginning as a Region Director in Texas. Direct P&L accountability for Western Division operation entailing approximately 1,000 employees in sales, customer service, operations and supply chain with $300 million in revenue and $17 million in EBIT. Developed sales inspection process that yielded a 60% increase in sales revenue over the prior year, best in the nation with sales representative revenue productivity increasing 82% year over year. Built from scratch a professional services practice for the first time in the company’s history. This unit generated $1M in profit after two years. Transitioned national sales force into selling digitally connected products with a new sales process that was taught to all sales representatives. Inaugurated Danka University, the first corporate education entity ever at Danka, delivering both classroom and online learning to all company employees. 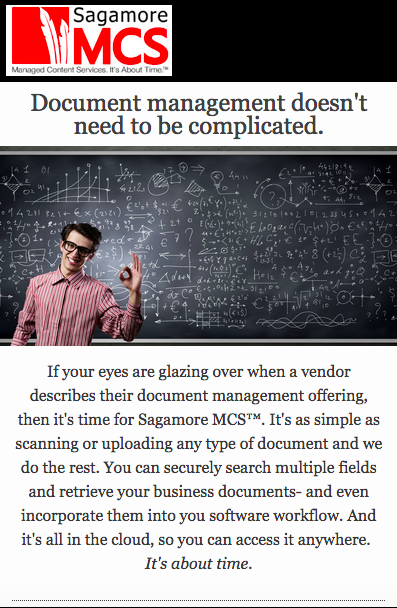 Sagamore MCS™ : Cloud based document management service to “democratize” business process outsourcing for any size business. New benefit for office equipment dealers, managed print services resellers and original equipment manufacturers. Majored in Public Policy, which never really came in handy. Real education was paying my own way through school. Fell in love with New Orleans, met my future wife...all good stuff and I try to make it back for Jazz Festival whenever I can.